He is the son of a World War I veteran who served in Russia in a largely, forgotten conflict. A ten year old boy whose mother died during the darkest days of the depression. A teenager who accidentally fractured his leg so horribly that he had to wear a brace during a year long recovery and was left with a permanent disability. A young man, adjudged by doctors to be physically unfit for military service, who tried enlisting anyway only to be rejected. 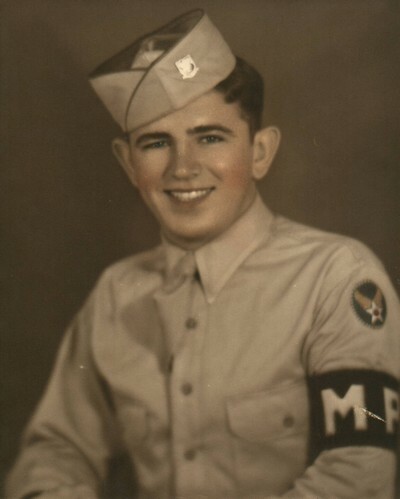 Then undeterred, to later reapply for enlistment and be ultimately accepted into the US Army in the Spring of 1943. After basic training and because of his physical disability he was assigned to a AAF MP company stationed in Clearwater, Florida. Sometime during that assignment he and one of his superiors had a disagreement that resulted in him being transferred to the a training command to be schooled as a firefighter on a crash crew. That training took him to the swamps of Louisiana where he learned to operate various types of heavy, wheeled truck type equipment in all sorts of terrain. From there he was sent to Fresno, California. He's never spoken much about Fresno so I'm unsure of his activity there. His next stop was Grand Island, Nebraska and, I believe, his first encounter with the B-29. He shipped out for Guam from Seattle, Washington in early 1945. - Engineer Fire Fighter School, Camp Pontchartrain, Louisiana, 6 wks, 1944, Crash Crew work and airraft fires and methods of control. - Military Police School, St. Petersburg, Florida, 5 weeks, Tactics of Military Police. During my childhood years (I was born on Jul 1945 while he was on Guam) I recall him speaking about many different things both war related and otherwise while serving on Guam. It seems that rats were a big problem on Guam and one of his diversions was to try and build a sea horse collection. This became an exercise in futility since the rats always found a way to eat the specimens while they were drying regardless of the safeguards devised to defeat them. On at least one occasion he was on a B-29 flight whose purpose was to shakedown a repaired plane and bomb the airfield on Rota. Rota was still held by the Japs and their airstrip had to be periodically bombed to keep them from assembling an attack threat. On another occasion, a P-51 landed at North Field and was refueled. Upon takeoff, one of its two wing tanks came off. The pilot lost control before he could jettison the other wing tank. My father was part of the group assigned to locate the pilot's remains in the jungle. Their first attempt netted all but the pilots head. Returning the next day they found the head wedged between two saplings. One Rainy night a B-29, returning from a raid on Japan, crashed short of the North Field runway. The men in my father's crash crew wanted to mount a search for survivors. From past experience they knew that when a B-29 crashed, the tail section would usually break away from the main body of wreckage and the tail gunner would sometimes survive. Their officer in charge refused to allow a search to be conducted. Disobeying orders, my father and his comrades descended the cliffs at the runway's end. Arriving at the crash site, they found that the tail section had been thrown free of the plane and the tail gunner, although injured, was still alive. My father never spoke of the rest of the plane's crew so one can only assume that they met a far worse fate than the tail gunner’s. The rescue party, equipped with little more than axes, rigged a stretcher from raincoats. Taking turns carrying the injured tail gunner, the men scaled the wet and slippery cliffs. The injured gunner was taken to the medical aid station for treatment. I asked my father if his crew received any sort of commendation for their action and he replied simply, no. I have often wondered whether the rescued tail gunner lived and if he had, did he know the circumstances of his rescue.